SEZA represents business entities and individual clients in a wide variety of litigation matters and business transactions. 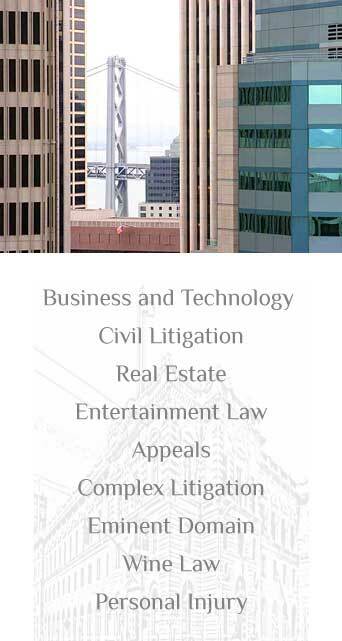 The Firm’s litigation practice encompasses a broad base prosecution and defense of litigation involving financial transactions, contracts, professional liability, real estate and construction, commercial disputes, personal injury, trust and estate issues, white collar criminal defense and employment. SEZA represents both plaintiffs and defendants and regularly appears in state and federal court as well as a wide variety of alternative dispute forums. At SEZA we take a multi-disciplinary approach to handling complex litigation matters and in advising clients on a wide range of legal issues. With broad industry knowledge and unparalleled experience in our areas of practice, we devise solutions that address each client’s particular needs and objectives to assure the highest levels of effective representation. We listen to your needs with an educated ear and an understanding of the challenges that businesses like yours face. Let our lawyers be your advocates when you have litigation needs.